What Is Instant Pot? And Why You Might Want To Invest In One. There is a worldwide lover affair with an Instant Pot. More and more households are adding this wonderful appliance to their kitchens, and for a good reason. If you’re new to Instant Pot’s charms, we’re here to tell you why it’s become such a global pressure cooking phenomenon. While pressure cooking has been around since the nineties – when the first patent for an electric pressure cooker was filed – it wasn’t until the 3rd generation of pressure cookers entered the market, that the cult of Instant Pot was born. So, what is so magical about the Instant Pot? That’s what we’re going to cover in today’s post. The Instant Pot is an electric pressure cooker that has 7 cooking functions, which sets it apart from many kitchen appliances with a single purpose. The Instant Pot does pressure cooking, rice cooking, browning, slow cooking, sautéing, and it keeps your food warm. Plus, it even has a handy-dandy yoghurt button. It contains a 6-quart stainless steel pot, so it’s plenty big for batch cooking, soups and stews. Plus, it’s simple to clean up. Plain and simple, the Instant Pot makes life easy. Whether you love cooking or you have trouble getting motivated, it cuts down the time spent in the kitchen. It makes it more efficient to cook healthy, nourishing meals that taste really, really good! For example, you can cook large roasts, broths, and stews that generally take 4+ hours to cook, in a mere 20 to 60 minutes. It also offers a timely way to cook grains, rice, lentils and beans. It’s also replacing many people’s crock pots and slow cookers since it has the ability to cook low and slow. Like we mentioned above, the Instant Pot is a dual-purpose kitchen appliance, so it’s especially handy for people with limited counter space, who want to utilise its multiple cooking abilities. Plus, once you’ve done the prep and set the Instant Pot to work, there is plenty of time to relax away from the kitchen. Once the cooking is done, the food will be kept warm for up to 10 hours. Finally, it’s a huge money saver! It allows home cooks to easily utilise cheap cuts of meat, save on waste with recipes for stocks and broths, and develop recipes that freeze well and can be used later down the road. What can you use the Instant Pot for? How much does the Instant Pot cost? The Instant Pot IP-DUO60 7-in-1 costs $99 USD in its 6-quart version, although you can choose a smaller or larger model. The 8-quart pot is around $160 USD. Look out for seasonal sales, when you can get this magical pot at a cheaper price. But trust us, the investment is so worth it. Where can I buy an Instant Pot? You can purchase an Instant Pot on Amazon, or you might find it at your local kitchen store or big box store that sells kitchen appliances. This review from The Kitchn chronicles eight months with the pressure cooker. Wellness Mama reviews the Instant Pot and includes some nourishing recipes. CNET reviews the Bluetooth-equipped version of the Instant Pot. This handy video review from A Pinch of Healthy outlines thoughts, tips, pros and cons. Here is a review by one of our contributing writers Alex, who owns not one but TWO Instant Pots. Is Instant Pot right for me? Instant Pot Recipe Cookbooks… Which one? So, you just got an Instant Pot. What’s next? Don’t be that person who bought the pot but hasn’t opened it, letting it sit in the box for months. Part of this is lack of time or just the intimidation factor. The Instant Pot can be a little scary when you keep hearing about the first time someone’s released the pressure valve. Baking isn’t everyone’s forte and we get that. Much like the Instant Pot makes cooking delicious meals an easier feat even for the amateur chefs, they can turn your baking mistakes into brilliant treats every time – minimal effort required. Cooking soups is one of the easiest things with Instant Pot and it’s a great way to use up root vegetables, such as butternut squash. They add starch and body to the dish without having to use too many other thickeners. This dish is gluten-free, paleo, vegetarian and vegan-friendly. Oh, pasta! It’s an undeniable love affair for many. What’s life without a little healthy indulgence? We love the endless varieties of pasta out there from hearty and sturdy penne to delicate angel hair and linguine dishes. Here are 20 pressure cooker pasta dishes that will impress even your Italian grandmother. Chicken wings are always a finger-lickin’ good choice that is totally worth the mess. For game day, barbecue parties and just preparing a super delicious dinner alongside a few simple sides. No matter what your craving, spice tolerance or sauce versus spice preference is, we’ve got an Instant Pot chicken wing recipe for you in today’s roundup. Break out the napkins! This vegan and gluten-free friendly Instant Pot chickpea stew is a delicious main meal full of Moroccan-influenced spices and flavors. Serve it over rice, couscous or with some crusty bread. Learn more about the Instant Pot on their official website. If you have any additional questions about the Instant Pot, ask away! 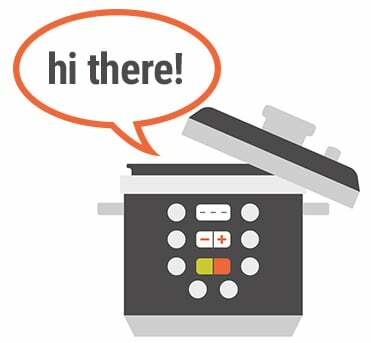 If you’re ready to purchase your Instant Pot, you can find the Instant Pot IP-DUO60 7-in-1 here.